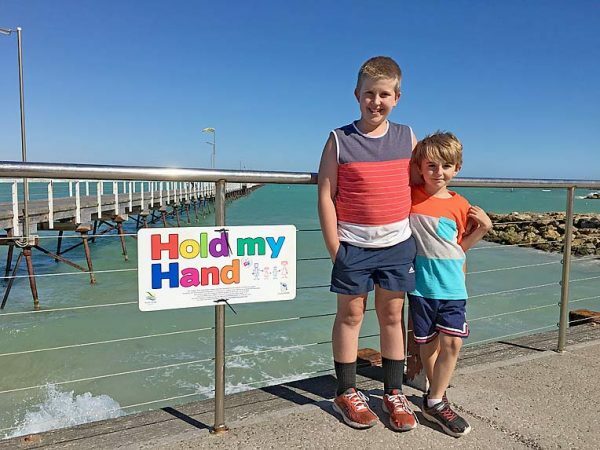 SAFETY FIRST: Todd and Brodie McDonald of Penola will remember to hold the hand of an adult when near the roads alongside the Beachport jetty this summer. HOLIDAYMAKERS at Beachport and Southend are urged to slow down this festive season particularly around children. Wattle Range Mayor Peter Gandolfi said with the influx of visitors to the seaside towns it is very important that drivers take extreme caution with many children enjoying summertime with their families at the beach.